KINGS OF COMEDY: Hill, Rogen, Franco, McBride, Robinson and Baruchel. When an antagonising video camera-wielding paparazzi taunts: “Hey, Seth Rogen! You always play the same guy in the same movie. When are you going to do some real acting, man?”, the target of the attack hides his face and meekly scurries away. Rogen, co-writer and co-director of apocalyptic comedy This Is The End, has clearly heard this criticism more than once. So a stoner comedy in which he and all of his celebrity actor buddies play themselves is a logical next step. In This Is The End, which Rogen created with regular collaborator Evan Goldberg, Jay Baruchel is setup as our fish-out-of-water hero. He is picked up from a Los Angeles airport by Rogen, his long-time friend and fellow Canadian. Baruchel, who has appeared in movies such as Million Dollar Baby, Knocked Up, Tropic Thunder and She’s Out of My League, isn’t a fan of the vacuous smiles and glamour of Los Angeles, but is coaxed by Rogen into visiting a wild house-warming party at the concrete monstrosity that James Franco has just moved into. WILD PARTY: The festivities take a turn at James Franco’s house. An array of familiar faces are partying hard at Franco’s house, Rihanna and Emma Watson among them. There’s a wonderful moment that reunites the three stars of Superbad. But Baruchel is an outsider and, uncomfortable with the looseness of proceedings, decides to leave to get cigarettes. Rogen accompanies him to a convenience store. While they’re choosing snacks, chaos strikes. The ground tremors and random people are caught in blue beams of light and pulled into the sky. In a thrilling sequence, Rogen and Baruchel race back to Franco’s house as Armageddon unfolds. The ground opens up and a number of celebrities plummet into the fires of Hell. But a core group of survivors – including Jonah Hill, Rogen, Baruchel, Franco and Craig Robinson – manage to barricade themselves in Franco’s mansion. Unsure of the origin of the madness outside, they decide to wait it out until help arrives. 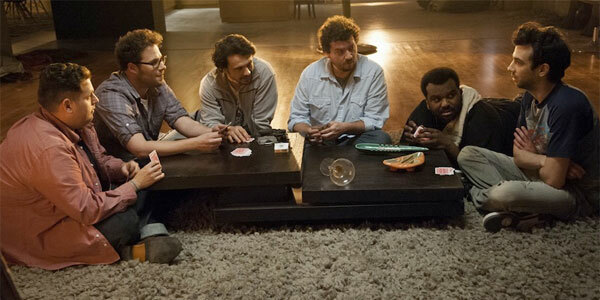 This Is The End brings together a group of actors who, for Gen Y, are Hollywood’s kings of comedy. Where our parents had Murray, Belushi, Aykroyd, Chase, Candy, Short and Martin, we have the cast of this movie. As a group, Rogen and co. are on the same wavelength and are masters of ad-libbed banter. As they lounge about and ration their supplies – mostly drugs and alcohol – the cast have childish and low-brow conversations that are elevated by sharp wit. But, of course, these are just versions of each actor. This is Rogen and Baruchel as we’ve always seen them. Hill camps it up with a diamond stud earring and references his Oscar-nomination for Moneyball. Franco plays himself as a shallow, vacuous child. When Danny McBride appears, it may as well be his Eastbound and Down character Kenny Powers entering the action – he’s truly obnoxious. Michael Cera has fun subverting the perception of him as a sweet, innocent kid. There’s no great philosophical or theological depth to This Is The End. Baruchel’s Jewish insights reveal the biblical nature of the situation outside Franco’s mansion and the script knowingly draws on the cliches of the group’s survival situation. They’re selfish celebrities and, as you would expect, are at each other’s throats after the first five minutes. The forced isolation does cause some of the cast to reflect on their privileged lives and ruminate on their true worth as humans. But that’s not really the point of the movie. This is a group of actors who have impeccable comic timing. The film is a vehicle for them to joyride in. Rogen and Goldberg have loaded This Is The End with references, not just of their own movies but to other classics. One of the best scenes draws on The Exorcist. A number of other moments are reminiscent of Frank Darabont’s The Mist, with the smoke billowed from fire and brimstone shrouding Franco’s house. There’s even a scene where Robinson ventures outside with a rope tied around his waist. Interesting, the very real sense of danger from beyond the barricaded doors gives the film an edge. And because the audience is already privy to this group’s twisted sense of humour, you have to prepare yourself for something unsavoury to happen at any moment. There are demons and monsters in This Is The End and they’re rendered with a wonderfully vintage, almost claymation-style affection. This Is The End may one day be considered a classic, if only because it captures this talented group of comedians and writers at the height of their powers. It’s a showcase. If you find Rogen and his friends funny, then you will be in Heaven. If you’re offended by their smutty interactions, then this might just be your idea of Hell. SPARKING UP: This Is The End is a vehicle for the cast to joyride in. “Jay Baruchel’s Jewish insights”? His character seems fairly Christian. Jay Baruchel himself has one Jewish grandparent, his paternal grandfather.